So Hungry Jacks in Australia are holding a competition to see who can come up with the best idea for a "Summer style burger". And, well, this is my idea of the perfect Aussie Summer Burger. Behold! The Whopper Summer Burger Tower!" Everyone knows bigger is better, and this supersized meal would go down in history as the biggest, baddest Whopper of all time! 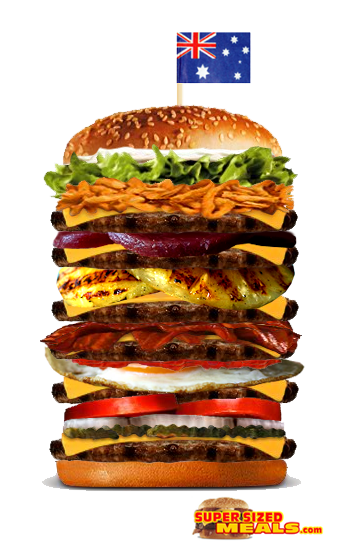 Behold, "The Whopper Summer Burger Tower"! This 10,800 calorie burger tower has all the flavours of an Australian summer with 6 slices of flame grilled beef topped with 6 slices of melted cheese, pickles, onions, tomato, egg, bacon, pineapple, beetroot, angry onions, lettuce, mayo and ketchup stacked on top of a fresh sesame seed bun. Speared together with an Aussie flag, this is one burger that will get you through a hot Aussie summer. The burgers are bigger and better at Hungry Jacks!